Because no one will love you more than you yourself. I read this blog post a few months ago and I was blown away by the simplicity of being happy through loving yourself and living your life the way you want. I might have been was going through a bad patch with relationship woes during that period, so I needed any self-help or inspirational quotes to get me through. I can’t remember if I had written or tweeted about it previously, but months later and seeing the web page still opened on my FireFox browser, I decided to re-read the post again. And guess what? The inspirational tips still make sense. We all deserve to be happy and it’s really up to us to make ourselves happy mentally, emotionally and physically because no one else will love us more, not even our parents. And why wait to make yourself and your life fabulous when you can start today, from this moment? Yes, life’s too short to wait for the day after tomorrow to take care of yourself when you’re the most important person in your world. Do what you want to do now because you’re worth it and you deserve the best in life. Take deep breaths throughout the day. Slow deep breathing improves your health and calms you down, according to my yoga instructor and many self-help books. When you’re more conscious of your breathing, you will also become more engaged with the present moment. You won’t think of silly things that trap you in the past or take you too far forward into the future where you might worry about things that have yet happened. When you are aware of being in the present, you live in the moment. And sometimes that’s all you need. You can still plan ahead, without overthinking it. Find the inner strength and courage to let go of the things and people that no longer bring joy and happiness into your life. Decluttering and spring-cleaning is not just for your room or before a festive season. You need to declutter the emotional junk that weighs down on you regularly . Be brave to clear out the ‘trash’ and negative people who obstruct your journey to happiness. You’re too awesome for them. It’s okay to make mistakes. If we don’t make mistakes, we won’t learn and we can’t grow and be even more awesome. Forgive yourself for past mistakes and know that while you can’t turn back time, you will never make the same mistakes again. So there’s no point in harping over it and letting the negativity eat your mind up. It’s time to move on. So forgive them and let them go. You don’t have to contact them ever again. Just know that you’ve learnt your lesson and will be better at avoiding such people from now. This is based on the Law of Attraction theory; when you set your mind to it and ask the Universe for the things you want in life, you will receive the best of the things you ask for at the right time. Ask and you shall receive. All it takes is self-belief and faith that when you want something, the universe conspires to help you to achieve your desires. It works. When you’re kind and loving toward yourself, you tend to treat yourself better in every way possible because you want the best for yourself. When you are pampered and respected by yourself, you’d naturally be in a good mood all the time (because there’s no reason to not be, right?!). When you’re in a good mood, you’re naturally nice to others and you tend to smile a lot. And kindness begets kindness, while smiling is contagious. Trust me, I’ve seen the cycle and it’s infectious. And others will start treating you the same way as you would to yourself. It could be for that day or in general. When you start listing down the little stuff to the bigger things and your list gets longer and longer as the days go by, you become happier and easily contented because you start to realise you have so much good things going for you. You start to see yourself as truly blessed by the universe and you feel lucky all the time because you’re always in such a good mood. See where I am going with this? Yes, it’s a cycle. When you appreciate the little things in life, bigger things arrive to make your life even more awesome. So yes, here are the seven inspirational tips that are largely based on the blog post and the numerous self-help books and articles on happiness I’ve read throughout my life. Now, go forth and love yourself and live your life the way you want. 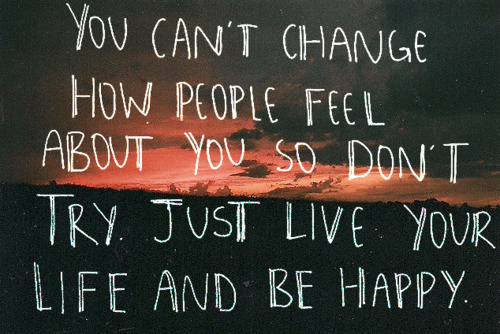 Just be happy.